Having built his ultimate battlewagon, this accomplished angler now wants to build one for you. 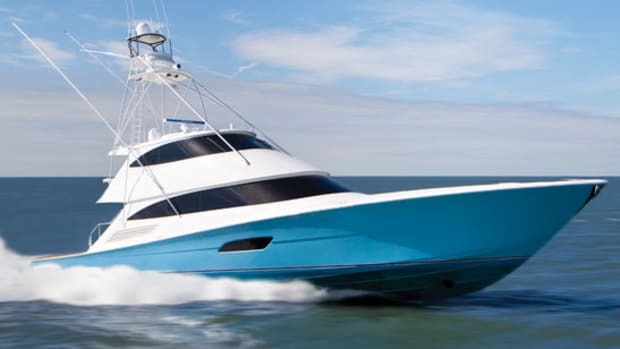 A successful businessman develops an interest in sportfishing that quickly evolves into an overarching passion—first for big fish and then, naturally enough, for big fishing boats. Soon the businessman becomes so knowledgeable and demanding about what he believes to be essential in a proper battlewagon that he cannot satisfy himself with anything currently available. He decides he must design and build his own boat to suit his own tastes. 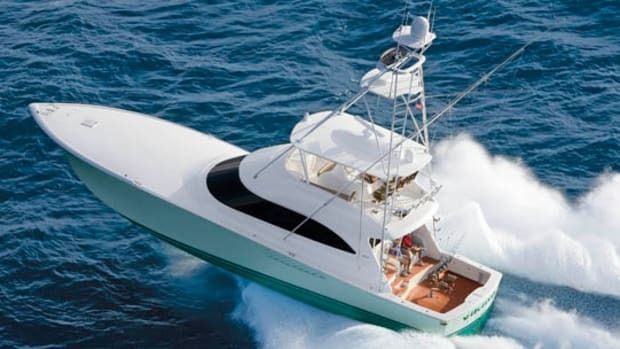 He ends up so satisfied with it that, believing there are more uncompromising aficionados like himself out there, he decides to go into the business of building a few very high-end boats for a few very high-end (i.e., money-is-no-object) anglers. He becomes a boatbuilder. Sound familiar? If it does it’s probably because it’s a story that’s been told again and again, sometimes as a case study in the near-perfection a single-minded, no-compromises enthusiast can achieve, other times as proof that success in one endeavor doesn’t always translate into success in another. Building a boat can be a rewarding and fulfilling enterprise; building more than one can quickly become a business that’s governed by the unromantic laws of commerce. This is the story of a boat built by a chap named Bill McWethy who followed his personal obsession. 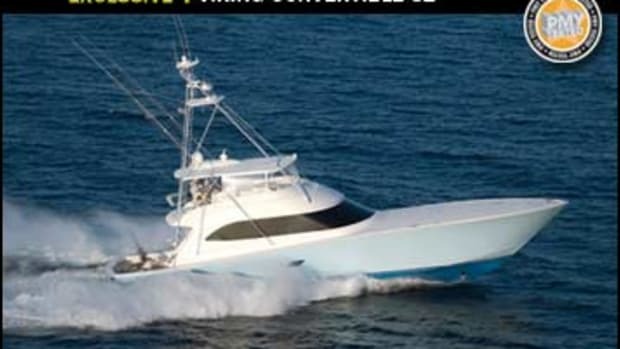 He has both money and major angling chops—winner of the Zane Grey and Bisbee’s Los Cabos tournaments and two-time winner of the Southern California Billfish Championship, to name a few. About eight years ago he got it into his head that he wanted to build what he would later describe as “the dream boat of every tournament fisherman.” And if that weren’t quixotic enough, he determined to build her in a suburb of San Diego, in a state where labor costs are high and regulations proliferate like rabbits. At this point you might question McWethy’s sanity, but you have to admit that he made at least one very smart move: He hired Tom Fexas to draw the hull. Fexas, who died in 2006, was justifiably famous for his soft-riding, efficient hull forms. This one, which evolved into the Titan 75 that I tested in San Diego in early January, may be the last Fexas design built. Whether it continued that tradition of seakindliness I can’t say, given the placid conditions on test day. But I can confirm other admirable traits. 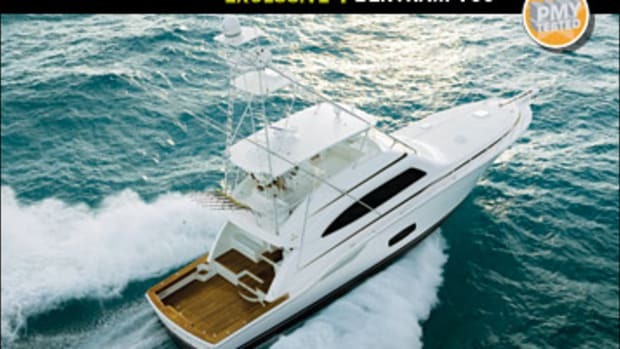 The boat is disarmingly agile, and her propeller pockets—something Fexas had a talent for—are perfectly configured, as evidenced by her quick planing, mild running angles, and lack of vibration, even when backing down hard. 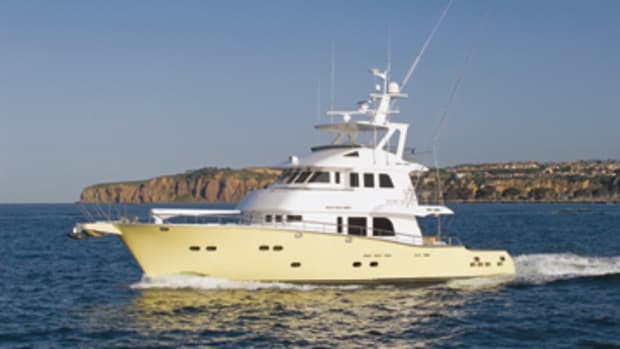 As to efficiency, one look at our specs and you realize that this is a big boat—her beam is 20&apos;6"—and even with an aggressive weight-saving regimen that includes extensive use of E- and S-glass, CoreCell, Kevlar, and carbon fiber (but with a solid-glass bottom), she’s listed at 133,000 pounds fully loaded. 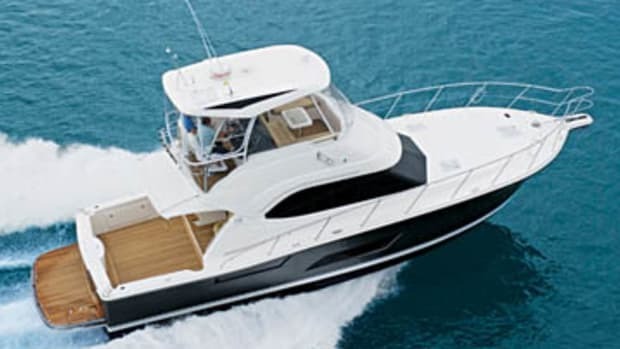 To push that mass to 30 knots—even with an efficient hull—requires a lot of thirsty horses—3,304 to be exact. Fortunately, the Titan has plenty of fuel, which resides in four tanks—two saddle tanks, a day tank, and a 700-gallon auxiliary tank under the cockpit from which fuel must be pumped forward. You’d think that emptying the aft tank would alter running trim, yet Hull No. 1 has no trim tabs because, says her captain, she doesn’t need them. Chalk up another one for Fexas. The hull form is clearly the foundation of this boat and a very good one. As to the layout, this being a custom boat, an owner can make any alterations that he pleases short of moving floors and bulkheads. 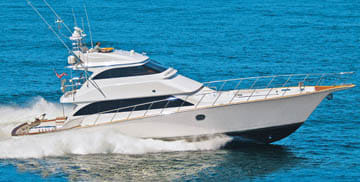 The unchangeable part of the plan includes a 270-square-foot cockpit (including mezzanine) that on this boat is laid out to accommodate McWethy’s fishing style. It’s dominated by a waist-high, 5&apos;7" long by 3&apos;8" wide, three-compartment bait module on whose after end is a receiver for a removable offset mount for the fighting chair. Thus to get into the chair an angler must climb up on top of the module. There are no cockpit fishboxes because McWethy is strictly a tournament guy who almost never fishes for dinner. Hull No. 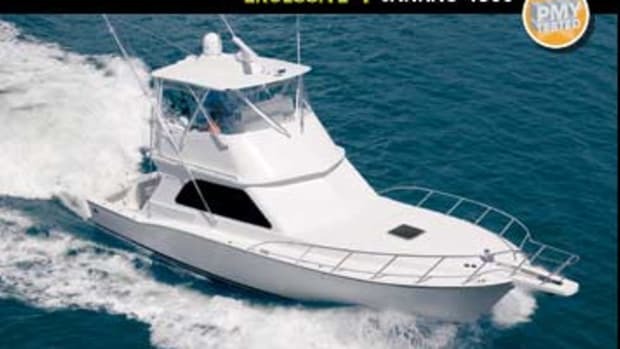 2, midway through construction, will have a more conventional cockpit with a sole-mounted chair and fishboxes, a Seakeeper gyro in place of this boat’s Wesmar fin stabilizers, and more powerful 1,700-hp Caterpillar C32 ACERTs. But its basic interior layout will be the same, which East Coast anglers will find a bit out of the ordinary. From the cockpit, you enter a saloon that feels small because the galley, which is U-shape and to starboard, is on a separate level, four steps up. 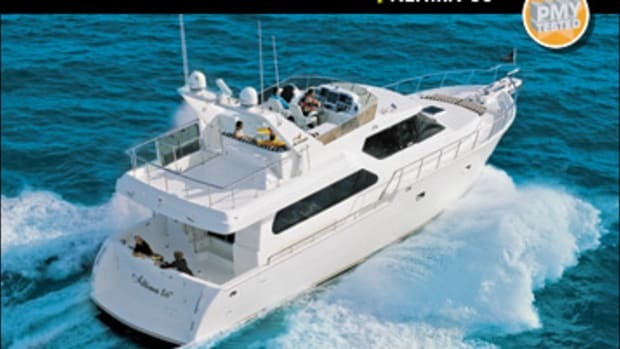 It is then eight steps down to the accommodations, which on my boat were a VIP in the forepeak and a full-beam master aft, amidships, and under the galley. Both staterooms had en suite facilities, but the starboard guest stateroom between them did not (there was a day head at the foot of the companionway) and its bunks—a high one forward and a low one aft—lie athwartships, which would seem to present problems in a seaway unless sea rails were fitted. But once again, this layout reflects one owner’s particular proclivities, which subsequent owners need not copy. 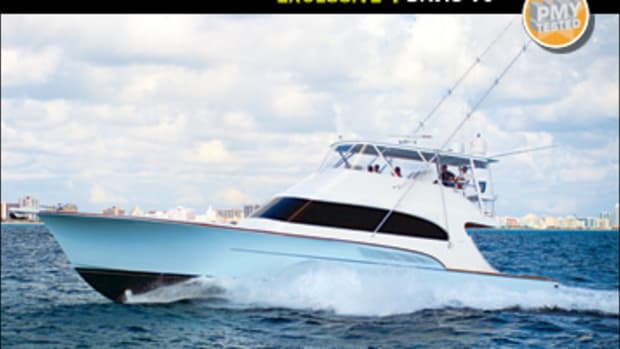 One thing that will not change on future boats is a flat foredeck, important on the West Coast because anglers there frequently employ the area for free-casting for marlin and other species. While East Coasters may not avail themselves of this possibility, they will nevertheless appreciate how easy it is to move around the area, the wide and protected side decks that lead to it, and the fact that all ground tackle is below decks where it cannot snag an errant foot.